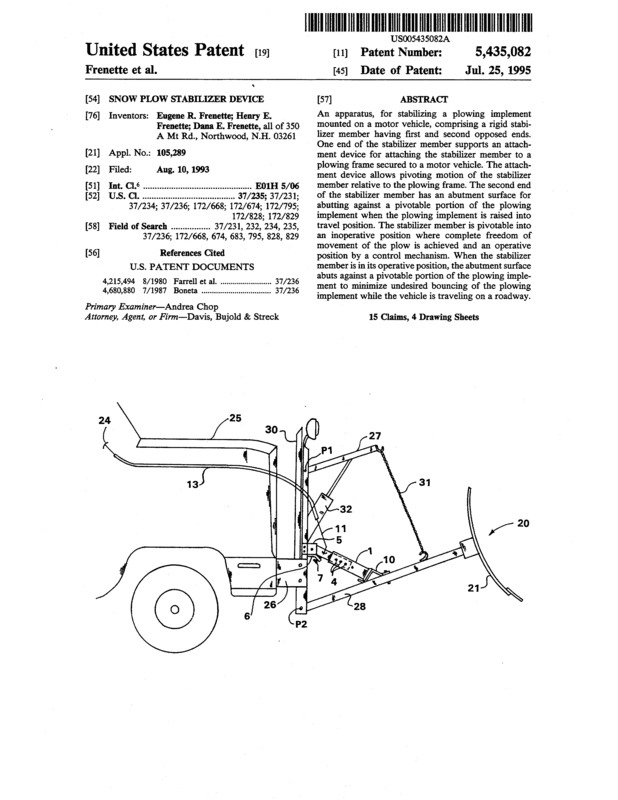 An apparatus, for stabilizing a plowing implement mounted on a motor vehicle, comprising a rigid stabilizer member having first and second opposed ends. One end of the stabilizer member supports an attachment device for attaching the stabilizer member to a plowing frame secured to a motor vehicle. The attachment device allows pivoting motion of the stabilizer member relative to the plowing frame. The second end of the stabilizer member has an abutment surface for abutting against a pivotable portion of the plowing implement when the plowing implement is raised into travel position. The stabilizer member is pivotable into an inoperative position where complete freedom of movement of the plow is achieved and an operative position by a control mechanism. When the stabilizer member is in its operative position, the abutment surface abuts against a pivotable portion of the plowing implement to minimize undesired bouncing of the plowing implement while the vehicle is traveling on a roadway. Page created at 2019-04-23 6:10:57, Patent Auction Time.